After the economical crisis of the 1930s, which had hit the Dutch shipyards particularily hard, the Kriegsmarine was a welcome customer. Soon after the German occupation in 1940 orders were placed for a series of 60 minesweepers, a project unheard-of in pre-war years. Also, production capacity was alotted to repair & refit orders, all work done to the full satisfaction of the Kriegsmarine. The Germans were impressed by the quality and the planning skills of the Dutch shipyards. Not only the managers benefited from this economical high tide, but all employees, workers and suppliers got a fair share of the pie. This frantic activity came to a grinding halt towards the end of the war, when, for obvious reasons, the German industry could no longer supply steel and other materials. The Germans encountered few difficulties when aligning the Dutch shipbuilding industry with the Third Reich's war effort. Actually, the shipyards had no choice. Other industries in the Netherlands faced the same dilemma. Making the most of a morally complex situation was the order of the day, while it was impossible to ignore the German military achievements, that until 1943 were both spectacular and impressive. 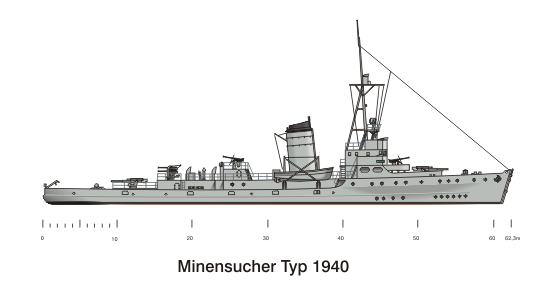 The contract for building 60 minesweepers to a Kriegsmarine design was one of the first orders for the Dutch shipbuilding industry. Wilton-Fijenoord took the lead for the hulls while Werkspoor was responsible for the machinery. They shared the construction activities with all major Dutch shipyards. 40 Keels were laid down in the Rotterdam region, 10 by the Schelde at Flushing and another 10 by two shipyards in Amsterdam. The design was also used in Germany itself. All together the Kriegsmarine took delivery of 131 MBoote 40, of which 71 were constructed in German shipyards. After placing the unusually large order for 60 minesweepers the Kriegsmarine in 1940 launched another major construction project, this time for 12 destroyers, also to a German design that was officially called Flottentorpedoboot Typ 1940. In 1941 a second batch of 12 vessels was ordered. The design envisaged a displacement of 2,546 tonnes. The propulsion plant was based on a Werkspoor design for the RNethN's Gerard Callenburgh-class, which was building in May 1940. 45,000 SHP would result in a trials speed of 35 knots. 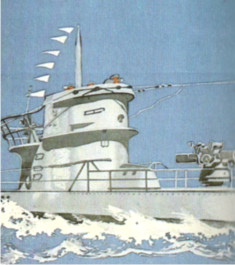 The armament was up to standard but not impressive for their size: 4 (4 x 1) 12,7 cm (5 in) guns, 4 (2 x 2) 37 mm (1.5 in) machine guns and 8 (4 x 2) 20 mm MGs, and last but not least, 8 (2 x 4) torpedo tubes. This destroyer project was also managed by Wilton-Feijenoord, and by Werkspoor as far as the machineries were concerned. However, almost from the beginning severe supply problems were encountered, because all German and Dutch industrial resources by now had been fully committed to the war economy. On top of this, progress was constantly hampered by repairs and other urgent jobs which the Kriegsmarine bestowed upon the shipyards. Over time the Flottentorpedoboot therefore ended up in the lower regions of the German priority lists. As a result, only eight hulls had been completed by 1944. One of them, T 66, was destroyed by an allied bombing attack on Flushing in October 1944. The Germans took the trouble to finish off the hulls of T 62 and T 69 by explosive charges on the Wilton stocks in the previous month. T 64 and T 70 met the same fate at the RDM shipyard. T 63, T 61 and T 65 had already been launched at the time and were being towed to Germany when T 61 was sunk by allied aircraft off Texel on Juni 12, 1944. After the war, the allies scuttled the remaining hulls off the Swedish and Norwegian coasts, fully laden with poison gas ammunition and bombs. Yet this history has a positive epilogue: Four propulsion sets had been completed by Werkspoor during the war. In the 1950s they went to sea after all, but now in the engine rooms of the new Dutch subchasers Holland, Gelderland, Noord-Brabant and Zeeland.